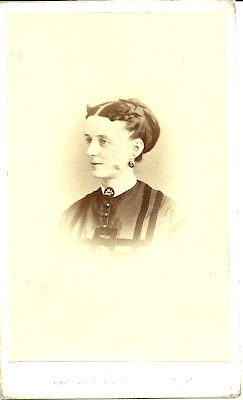 Carte de Visite of a middle aged woman identified on reverse as Louise Paraga. 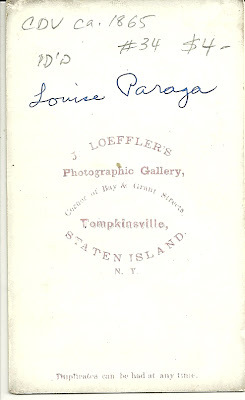 The CDV was made by the J. Loeffler Studio of Tompkinsville, Staten Island, New York. The previous owner left a penciled notation that the CDV was of about 1865 vintage. Thanks to Brett Payne's Photo-Sleuth blog, I know that photographs usually carried a revenue stamp during the time frame of June 1864 to August 1866, as a way to raise revenue during the Civil War and its aftermath. Perhaps this CDV was produced after 1866? 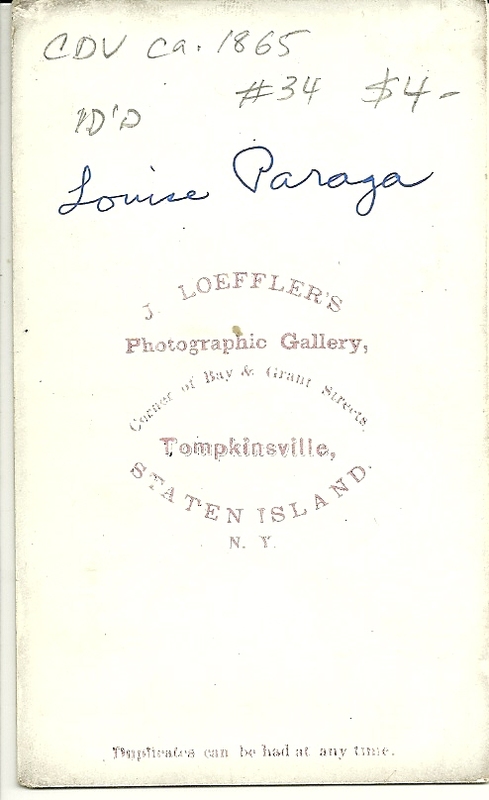 I found several several women with variant spellings of Louise Paraga, but I'm not sure any of them is the lady I'm looking for, as I believe they were born later than what I imagine to have been her birth year. If you have any insights into the identity of Louise Paraga, please leave a comment or contact me directly. Thanks! Nice to see another Loeffler CDV, and thanks for the mention of my blog. The card design reverse is not too dissimilar to my example, and I'm guessing that your portrait was taken not long after, perhaps 1866-1868ish?